We were challenged to take a creative photo showing the USPs of the pram in use. Our photo – along with those of a group of bloggers – is currently over on the M&P Facebook page. There’s some great pictures, you can vote here for your favourite and the blogger with the most votes will be giving away an Armadillo Flip XT worth £500 (so you could be in with the chance of winning one). If you’d like to vote, that would be fab, thank you! 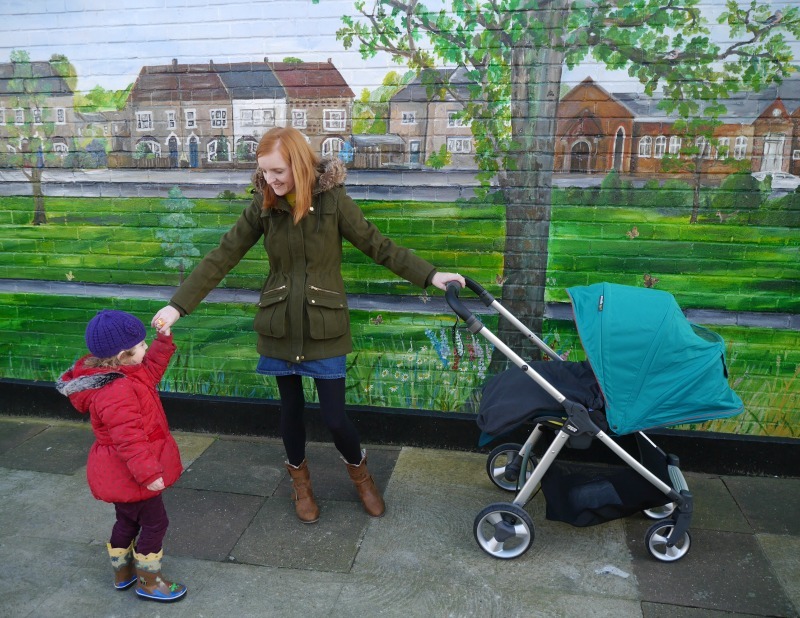 We wanted to show that due to the small fold and light weight it’s a great pram for using in London, but wanted to flip it (see what we did there?) 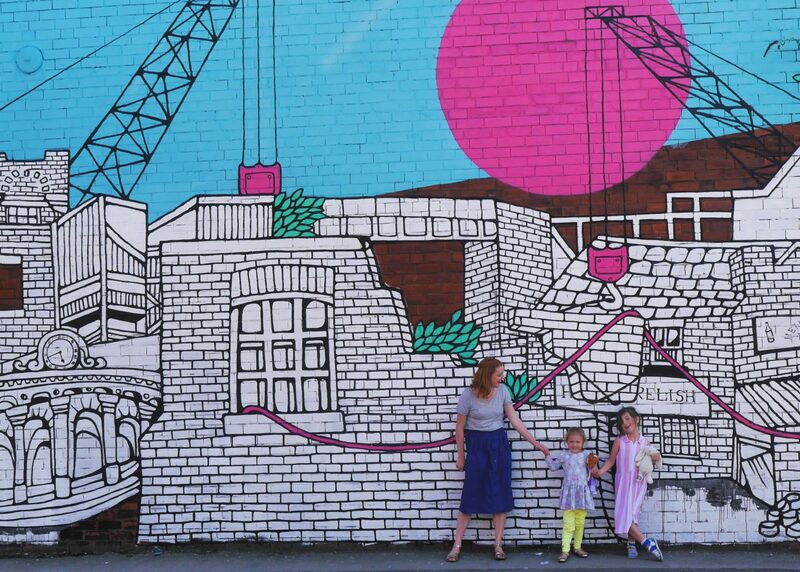 so our photo is the wall art of our local area. We’re highlighting the excellence of the big hood for naps; Florence was asleep inside and Eliza’s using the handy hood window to check on her. It was fun taking the photos, although as usual Alex took a LOT of persuading as it’s his most hated job (anyone else have this? Poor blogger partners, they need some sort of union). 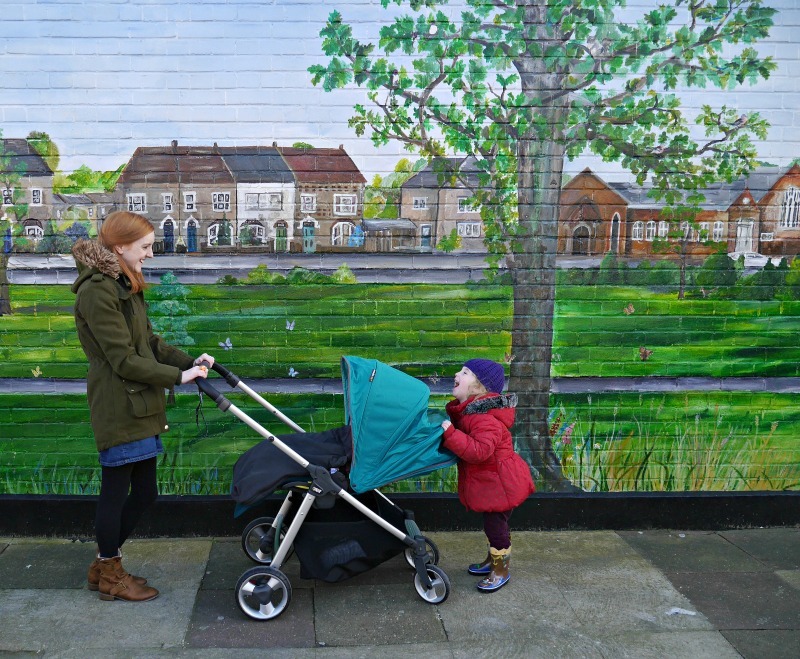 My criteria for buggies – based on living in London, not having a car, and using public transport – are that they have to be as small and light as possible, as well as parent facing. This is the closest to our current pram (Bugaboo Bee+) that we’ve tried. And it’s a better colour. The Armadillo Flip XT also has a number of new USPs including the larger seat, all-terrain wheels and an easy one-handed fold. Full review to come shortly. You can vote in the Mamas & Papas blogger competition here if you have a second – thank you! Hi! I am just wondering what you think of that stroller? You have been using it for some time now right? I am really leaning towards the XT but would like your opinion on it, daily use, etc. What do you think of the basket? Is it big enough and when full does it drag? What do you think of the frame? All your feedback is much appreciated.